The Minister of Defence of the Russian Federation General of the Army Sergei Shoigu addressed to the President of the Republic of Azerbaijan Ilham Aliyev: “Speaking about tasks assigned to military departments of two countries, we will do our best to make a provision for everything you had agreed on with the President of the Russian Federation concerning military and technical cooperation”. Sergei Shoigu expressed his gratitude to the colleagues from Azerbaijan for participating in the International army Games, which had been held in the territories of Russia and Kazakhstan. General of the Army Sergei Shoigu and Ilkham Aliyev discussed topical issues of bilateral military and technical cooperation between two countries as well as problems of regional and international security. BAKU, August 8. /TASS/. Both Azerbaijan and Iran are interested in Russia as the biggest exporter of high-quality weapons, Russian Deputy Prime Minister Dmitry Rogozin said on Monday after talks between the leaders of Russia, Azerbaijan and Iran. Rogozin noted that the countries of the region are getting consolidated in the face of common threats, with close location of hotbeds of local conflicts and spreading extremist influence among them. “These are common threats. And common threats should be repelled not only through solidarity, through such meetings and discussion of ways of rebuffing challenges by political means, but also through physical strengthening. And in this context, both Azerbaijan and Iran are interested in Russia as the biggest exported of high-quality and affordable weapons,” he said. He said the issues of military technical cooperation at the trilateral talks stemmed for the general discussion of security problems in the regions. “Discussion of military technical cooperation topics was a logical consequence of the subject of security,” he added. Rogozin went on to say that a helicopter center and an aircraft-assembly plant will be opened in Baku. “A helicopter center will be established in Baku. There are many planes and helicopter of the Soviet and Russia make in Azerbaijan. 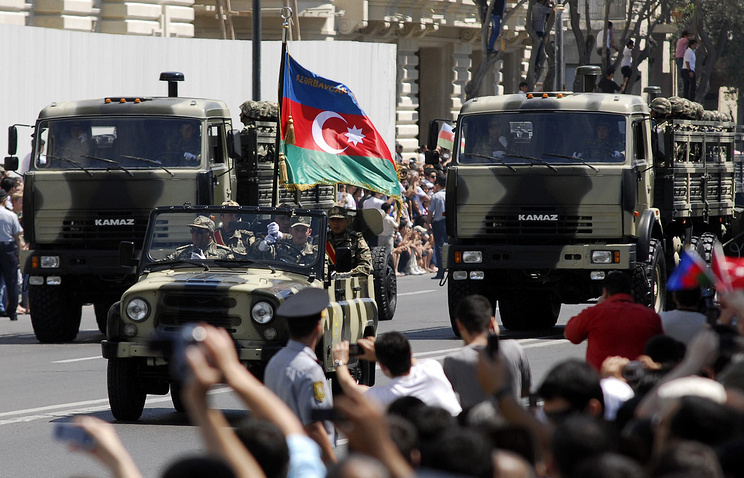 So, they will be modernized and serviced in Azerbaijan,” he said. Apart from that, he said it is planned to “open an aircraft assembly plant in Baku.” It will make it possible for Azerbaijan to join the narrow circle of countries which have aircraft-building industries. According to Rogozin, Azerbaijan is interested in buying Russian MC-21 planes and Russia hopes to sign a contract for ten such aircraft by February 2017. “Azerbaijan is interested in buying Russian MC-21 planes. And after the first flight of this plane – we plan it will take place either at the end of this year or at the beginning of the next year – we want to sign a contract for at least ten MC-21 planes in February,” Rogozin said. Apart from that, Moscow and Baku discussed Azerbaijan’s plans to buy Ruslan An-124 planes. “It is a serious deal and it will be stricken already next year,” he said. The Russian deputy prime minister noted that despite a decline in economic cooperation in the monetary terms in the past 12 to 18 months, physical volumes of cooperation are still preserved. And to encourages further growth “we are developing cooperation in non-traditional sector, such as industry and high technologies,” although the focus in the previous years was on agriculture, Rogozin noted. BAKU, July 21. /TASS/. Azerbaijan’s Defense Ministry has dismissed reports about establishing a Turkish military base in the territory of the country. “Media reports about establishing a military base of any foreign state on the territory of Azerbaijan have no grounds and do not correspond to reality,” Deputy Defense Minister Ramiz Takhirov said on Thursday. Several media reported that a Turkish military base would be established in the territory of Azerbaijan. Last Wednesday, Azerbaijani President Ilham Aliyev signed a decree on adopting an inter-governmental protocol on leasing to Turkey buildings and facilities in the Gyzyl Sharg military town and a terminal at an aerodrome in the Hajji Zeynalabdin Taghiyev village near Baku. Takhirov said that the aerodrome in Hajji Zeynalabdin Taghiyev has been used since 1999 for transporting Azerbaijani servicemen participating in peacekeeping missions in Kosovo, Iraq and Afghanistan by Turkish Air Force aircraft. “According to the approved protocol, a building located on the territory of the Gyzyl Sharg military town and used since the 1990s was leased to a Turkish military attache in our country. This protocol provides a legal opportunity for those who lease the building to carry out repair and restoration works there,” the deputy defense minister said. MOSCOW, July 19. /TASS/. Russia is committed to maintaining parity in the supply of military equipment to Armenia and Azerbaijan in the conditions of the intensified Nagorno-Karabakh conflict between the two countries, Director of the Russian Federal Service for Military-Technical Cooperation (FSMTC) Alexander Fomin said in an interview to the Izvestia daily published on Monday. “Conflicts begin regardless of the fact that one side may be armed better than the other,” Fomin said. “However, it is necessary to seek parity, so Russia is taking efforts to maintain parity both in absolute terms and in the quantity and quality of the basic weapons systems”. Fomin also said that the main purpose of military-technical cooperation is to preserve peace and stability in a given country, in a region and in the world in general. “Russia’s military-technical cooperation system is organized in such a way as to cause no harm, including to a particular region. We make all the decisions on the delivery of arms to one or another country invariably with taking into account such acute regional situations”, he added. 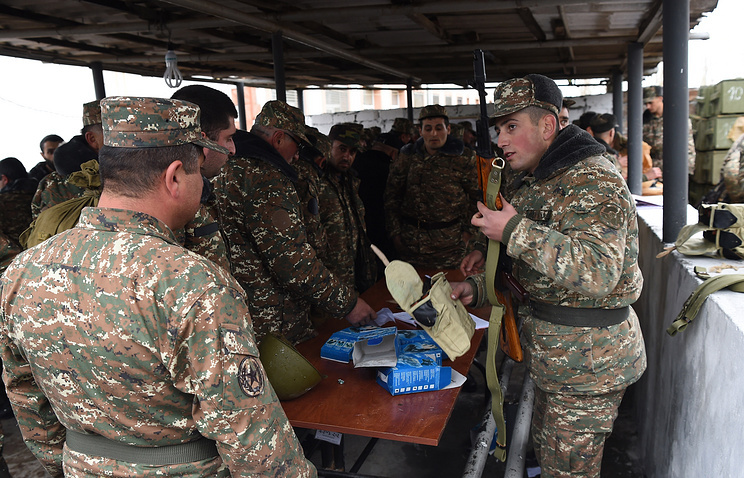 The situation along the line of engagement in the Nagorno-Karabakh conflict zone deteriorated dramatically overnight to April 2 when fierce clashes began. The parties to the conflict accused each other of violating the truce. On April 5, Azerbaijan’s Chief of Staff Nadjmeddin Sadykov and his Armenian counterpart Yuri Khachaturov met in Moscow with Russia’s mediation. At the talks the sides came to an agreement on cessation of hostilities at the line of engagement between the Azerbaijani and Armenian forces. On the same day, the two countries’ defense ministries announced that the ceasefire regime in Nagorno-Karabakh would start at 12am local time. Since then, the parties to the conflict have been accusing each other of violating the ceasefire agreement. On May 16, the presidents of Armenia and Azerbaijan met in Vienna. Serzh Sargsyan and Ilkham Aliyev agreed to “make steps to monitor observance of agreements on ceasefire and introduce a mechanism on investigating incidents.” The participants in the Vienna talks on Nagorno-Karabakh on May 16 that also involved the Armenian and Azerbaijani presidents, with mediation of the foreign ministers of the countries co-chairs of the OSCE Minsk Group (Russia, the United States, France) reach an agreement on observing the ceasefire in the region in the format of the 1994-1995 agreements. In addition, the conflict sides agreed to complete as soon as possible the work on the OSCE mechanism for investigating incidents at the line of engagement of the conflict sides. On June 20, Russian President Vladimir Putin and his Armenian and Azerbaijani counterparts Serzh Sargsyan and Ilkham Aliyev adopted a trilateral statement where they expressed commitment to the normalization the situation along the engagement line in Nagorno-Karabakh. Russian Deputy Prime Minister Dmitry Rogozin said previously that Russia would continue to supply weapons to Azerbaijan and Armenia as its strategic partners under the corresponding contracts. Azerbaijani President Ilham Aliyev said that Azerbaijan is buying new weapons and other military equipment, local media reported Saturday. BAKU The violence in Nagorno-Karabakh, an Azerbaijani breakaway region with a predominantly Armenian population, escalated on April 2. Baku and Yerevan have accused each other of provoking hostilities that led to multiple deaths on both sides. The parties agreed on a ceasefire on April 5. “We are buying military products from many countries. In other words, we are not dependent on a single source. In this area, as in all other areas, we are going to diversify our way. Of course, we must continue to try and will always try to supply Azerbaijan with the most up-to-date weapons and other military equipment. Azerbaijan has already started importing new types of weapons and other equipment,” Aliyev said, according to the Trend news agency. According to Aliyev, Azerbaijan is currently in war, so military matters require the most attention. On June 20, Armenian Foreign Minister Eduard Nalbandyan said that the trilateral meeting between the Armenian, Russian and Azerbaijani leaders on Nagorno-Karabakh conflict settlement was constructive. Prior to the meeting, on June 19, Aliyev said that Azerbaijan hopes for a peaceful resolution of the conflict in Nagorno-Karabakh. The conflict in Nagorno-Karabakh began in 1988, when the autonomous region sought to secede from the Azerbaijan Soviet Socialist Republic, before the latter proclaimed independence with the collapse of the Soviet Union in 1991. The warring sides agreed to a cessation of hostilities in 1994. Azerbaijan Defense Ministry said that Baku and Ankara are holding joint military drills in Turkey. Baku and Ankara are holding joint military drills in Turkey, the Azerbaijan Defense Ministry said Monday. “According to the military plan of bilateral cooperation, Azerbaijan and Turkey launched the ISIK-2016 military drills,” a press release from the ministry reads. According to the Azerbaijani Defense Ministry, three Mil Mi-17 military transport helicopters and three Mil Mi-35 attack helicopters left Azerbaijan for a Turkish military base in the central city of Konya. The exercises, that according to media reports will reportedly involve troops from Hungary, Romania, Saudi Arabia and Northern Cyprus, are due to last until June 30.